For trouble free motoring and peace of mind this festive season, check out our top tips for keeping safe on the roads this winter. It’s important to use screenwash in the car’s washer tank to prevent freezing and subsequently cracking. Depending on the product selected, this also acts as an anti-freeze to prevent re-icing and the washer jets freezing over. It’s not recommended to use standard antifreeze in the washer tank due to its corrosive tendencies when exposed to rubber trims and paint work. For anti-freeze in the car’s cooling system, check the recommended brand in the driver’s handbook as often new vehicles have a long-life anti-freeze that is best not mixed with other types. Ideally, a 50/50 mix is required with water to ensure the radiator and overall car health remains optimised. If the car begins to overheat after only a short time of driving it is likely the radiator is frozen and the water cannot absorb the engine heat. The best course of action here is to safely stop and allow it to thaw. Before setting off on your journey ensure all ice and leaves are cleared from the windscreen and windows. Additionally, spray from other vehicles, especially wagons, can result in a build-up of grime that can seriously obscure vision, especially when combined with dazzle from the low winter sun and dirt on the inside. Clear any remaining snow from the roof as this may fall during driving and cause visibility issues. Although in the daily commute it’s difficult not to rush, make sure both the front and rear windscreens are fully de-misted before hitting the road. Often it’s the small things neglected that cause the greatest hazard and poor condition windscreen wipers fall into this category. Replace the blades when they begin to smear and don’t leave them on the windscreen in a parked position as they may freeze to the glass and become damaged when you turn the ignition on again. Although not an attractive task in the colder months, it’s important to ensure your vehicle remains clean, not for aesthetical but practical purposes. Keeping headlamp lenses clean improves visibility, maximising light from the bulbs. For winter, 3mm is the optimum tread depth to ensure sufficient grip with the correct PSI indicated in the driver’s handbook. Reducing tyre pressure doesn’t improve grip, in fact it reduces stability and handling. Although snow chains are excessive (unless you live in a particularly isolated location) changing your tyres for winter is a smart option. Selecting winter or all season tyres improves grip in wetter conditions as the higher silica content results in the tread hardening in lower temperatures, retaining their intended form. 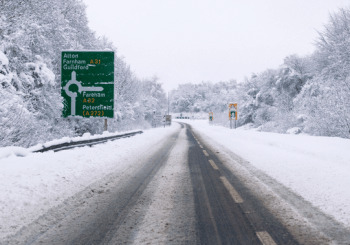 When setting of in snow, do so with low revs in 2nd gear, trying not to stop on hills by maintaining a constant steady speed to maximise handling. If approach a downwards hill try to use engine brake through selecting a low gear and being light on the brakes, keeping a safe distance from any vehicles in front. The key is to approach manoeuvres gently, avoiding over steering and excessive speeds/braking. As weather conditions deteriorate and the rain begins to fall, extra demand is placed on your vehicles battery as lights, heaters and wipers are all powered from the same hub. This can cause issues when driving in poor weather in the dark, common in rush hour commutes when the clocks go back. Batteries have an average life span of around 5 years so it’s best to consider replacement when yours begins to approach this age, avoiding inconveniences such as the car failing to start. It’s important to turn all electrically powered features off before attempting to start the car as these only drain the power that’s provided. It is also handy to avoid running electrical appliances in the car longer than necessary, such as the rear window heater and the front heater fan. Take time to plan your route, selecting those that are likely to have been gritted or cleared of any storm debris or snow. Factoring in a delay means you are less tempted to rush and subsequently make a mistake. Give yourself a good ten minutes to de-ice the car windscreen and warm up the engine. Sensible shoes mean more responsive driving and avoid heavy braking and over revving. When driving this winter remember: preparation is everything!